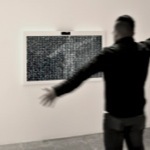 Rafael Lozano-Hemmer - Project "Eye Contact"
Eye Contact is the first piece of the Shadow Box series of interactive displays with a built-in computerized tracking system. 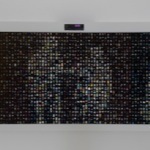 This piece shows eight hundred simultaneous videos of people lying down, resting. 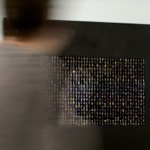 As soon as a public member is detected, his or her presence triggers the miniature video portraits to wake up: hundreds of people simultaneously turn to look at the visitor directly, creating an uncanny experience that questions who is the observer and who is the observed. Keywords: database, print, indoor, tracker, interactive. 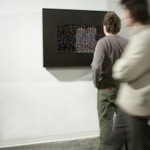 Inpoliticos, Palazzo Art Napoli, Naples, Italy, 2009. Synthetic Times - Media Art China, A Beijing Olympics Cultural Project, National Art Museum of China, Beijing, China, 2008. Auto Emotion, Power Plant, Toronto, Ontario, Canada, 2007. ARCO '06, Galerie Guy Bärtschi, Madrid, Spain, 2006. Art Basel 37, Galería OMR, Galerie Guy Bärtschi, bitforms gallery, Basel, Switzerland, 2006.